Loss of eye tissue in blind cavefish (Astyanax mexicanus), which occurs within a few days of their development, happens through epigenetic silencing of eye-related genes, according to a study led by the National Institutes of Health. Epigenetic regulation is a process where genes are turned off or on, typically in a reversible or temporary manner. This mechanism differs from genetic mutations, which are permanent changes in the DNA code. The study appears in Nature Ecology & Evolution. "Subterranean animals provide a unique opportunity to study how animals thrive in extreme environments, some of which can mimic human disease conditions," said Brant M. Weinstein, Ph.D., senior investigator at NIH's Eunice Kennedy Shriver National Institute of Child Health and Human Development (NICHD) and one of the study authors. "Many of the cavefish genes identified in our study are also linked to human eye disorders, suggesting these genes are conserved across evolution and may be similarly regulated in people." A. mexicanus is a tropical freshwater fish native to Mexico. A few million years ago, some of these fish presumably got trapped in dark caves and gave rise to completely different varieties, or "morphs," that lack eyes and have several other unique physical, behavioral and physiological changes. Despite their dramatic differences, surface and cave morphs share similar genomes and can interbreed. Cave morphs begin eye development early but fail to maintain this program, undergoing eye degeneration within a few days of development. Previous research has not revealed any obvious mutations in genes important for their eye development. 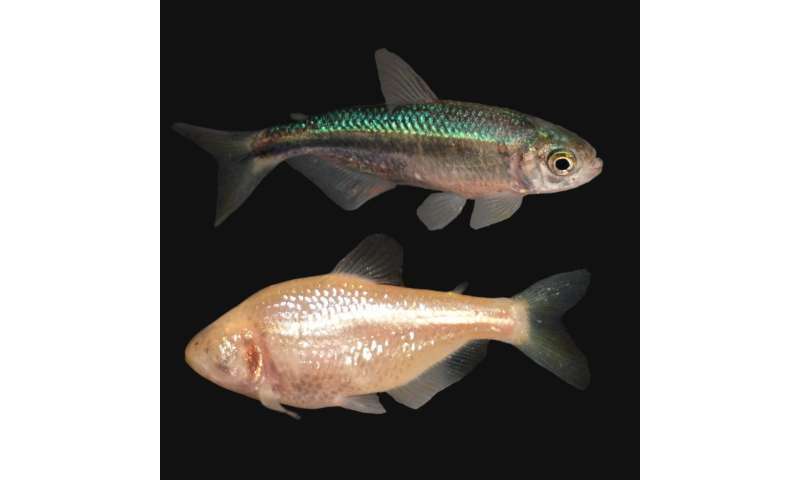 The new study, conducted by researchers at NICHD and the University of Maryland, College Park, shows that epigenetic-based silencing of a large set of genes limits the eye development of cave-dwelling A. mexicanus fish. Twenty-six of these genes are also expressed in human eyes, and nineteen are linked to human eye disorders. The study team found more DNA methylation of eye development genes and subsequently, less activity of these genes in cavefish. DNA methylation is an epigenetic process in which DNA is modified with tags called methyl groups. These tags, which are added by proteins called DNA methyltransferases, silence genes by making the DNA inaccessible. The authors found that cavefish have higher levels of a DNA methyltransferase, called DNMT3B, in their developing eyes. When the study team mutated DNMT3B in another type of fish with eyes, zebrafish, they discovered that the mutant zebrafish have more active eye genes and larger eyes. The results suggest that a genetic change resulting in elevated DNMT3B levels occurred during the evolution of cavefish, leading to epigenetic suppression of eye development genes. "Our study indicates that small genetic changes that alter epigenetic regulation can play an important role in evolution by triggering dramatic changes in the expression of large sets of genes," said Aniket V. Gore, Ph.D., the study's lead author.